The Camoplast T4S system is not only the industry standard, it’s also the best performing track system in all conditions. Enjoy optimum performance all year long regardless of weather. 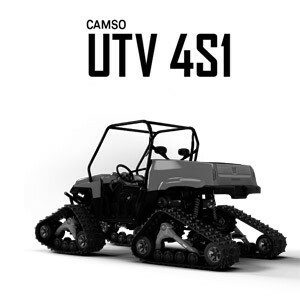 system of choice for use in deep snow, swamps, marshes, mud, and muskeg. side-by-sides and provides greater load capacity than any other track system. A better way to turn dirt into snow. 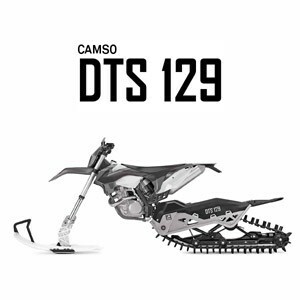 Camso dirt-to-snow bike conversion system is an aftermarket solution for Powersports enthusiasts looking to convert their off-road motorcycle to a track and ski vehicle. 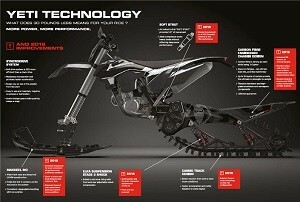 It allows them to ride year-round by combining motocross agility and snowmobile performance. YETI is the lightest snow bike conversion system on the market in its sector. High quality technology. Carbon fibre engineered chassis design. Titanium hardware and high-grade aluminium and aerospace components. 4 track sizes based on driving style. With some modifications R.F. Moto has been able to install the track system Camoplast UTV T4S on the Suzuki Samurai and the Jimny.